Teh (right) and Mah Sing executive director Lim Kiu Hock with a model of Southbay Plaza. GEORGE TOWN: Mah Sing Group Bhd's projects in Penang is expected to generate about RM325mil or 13% of the projected RM2.5bil sales for 2012, compared with RM70mil or 3% of the RM2.2bil sales for 2011. The key contributors from Penang included the Southbay Plaza and Legenda@Southbay, group chief operating officer Teh Heng Chong said at Mah Sing's “Realising Dreams Property Showcase” held in conjunction with the group's 18th anniversary celebration in Penang recently. The event showcased 11 projects that it was currently undertaking nationwide. “The Legenda@Southbay has generated about RM40mil since January, while the Southbay Plaza has generated RM80mil since May. “The other project that we expect to generate the remainder this year is the first phase of the Ferringhi Residence in Batu Ferringhi. 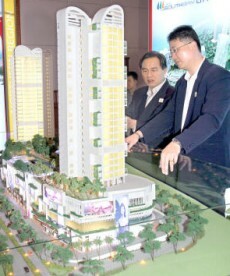 “Pending approval, we plan to launch about RM180mil worth of low-rise condominium villas in July 2012,” Teh said. He said the Klang Valley would still make up the bulk of the group's sales target, as it had 28 projects there. Teh said he was positive on the outlook for the property market in Penang as the most of the buyers of Mah Sing's properties are largely Penangites. “Our foreign customers come from Singapore, Indonesia, and Hong Kong.